Six more shopping days ? - We'll be having a break ! The pre-Christmas posting rush is nearly over, and soon we can all relax. 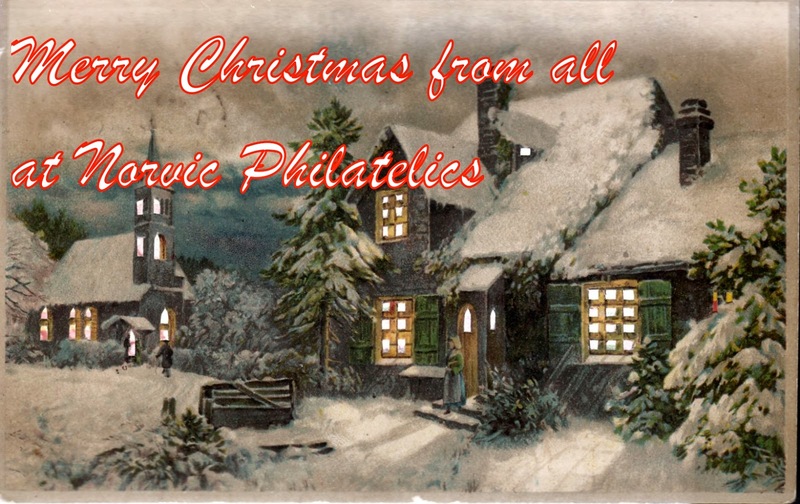 Perhaps you will get some philatelic goodies in our Christmas sacks - a new UV lamp, or a new stockbook? A big bag of kiloware so that you can hunt for the elusive 'direct-mail-only' security Machins, or some scarce Post and Go stamps at 2nd class rates on flags, or flowers, or anything else that they shouldn't be on! The queues of people at Post Offices still posting parcels, or mail-order returns or - like me - sending out orders continues unabated. The future looks good for the Post Office branch network and for Royal Mail while it can maintain a good level of parcel and packet business. We will not be posting anything next week, and maybe not the week after - it will depend on how well the relaxing goes, and how fine the weather is. So the office will be closed from 22nd December to 2 January 2015. But stamp ordering on the internet is a 365/24/7 process: last year we had orders on 24 and 26 December. As usual orders placed in this time will be dealt with as quickly as possible after we return, and those posted after 6 January may have Alice in Wonderland stamps on. It is, of course, a time for family and friends, and particularly for children, and we will have a quiet family day on 25th, and a hectic multi-family day on 28th with a visit to a household which should have at least 16 people by the time we arrive! We would like to thank all readers and contributors to our blog - without you it would be far less useful - and most of all, thanks to our customers. Thanks, too, for the Christmas cards and other greetings that you have sent in the last few weeks: they really are much appreciated by the whole family. This year's picture is adapted from a 1905 'hold-to-light' picture postcard, which has cut-away sections on the top picture layer, to allow the windows to be 'lit' when held to the light - probably candle-light when these were posted to rural areas of Norfolk, 109 years ago.